The importance of coal in the global energy mix is on a decline due to the shale gas boom in the US and quest for cleaner energy. However, coal remains the cheapest fossil fuel available for electricity generation globally. 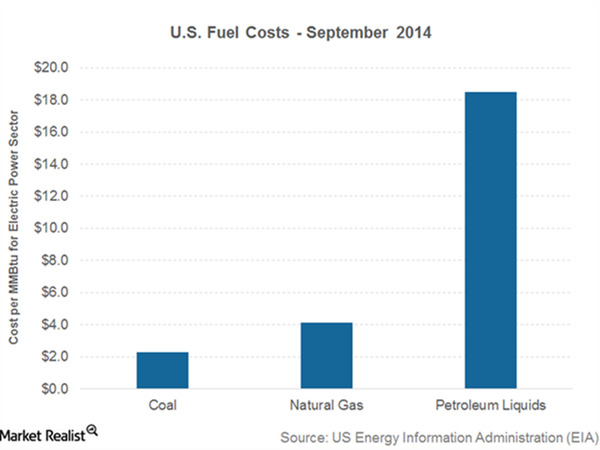 According to the US Energy Information Administration, coal for electricity generation in the US cost $2.3 per million Btu (British thermal units) compared to $4.1 per million Btu for natural gas in September 2014. Moreover, coal is available almost everywhere. So coal is the ultimate option for electricity generation where natural gas isn’t available in great quantities. In these places, coal is even cheaper compared to natural gas. India and China are two prominent places where the threat to coal from natural gas is limited. Despite all the issues the coal industry is facing, global coal-fired capacities are expected to continue to increase—albeit at a slower pace. India remains an attractive market for equipment manufacturers for coal fired boilers. India is expected to add another 150 GW coal-fired capacity over the next two decades. While coal is slowly losing its steam in the developed world (especially in North America), coal remains the only economically viable option for power-hungry developing countries, especially in Asia. However, according to General Electric, growth in natural gas–based capacity will outpace coal-fired capacities over the next decade. Over the past decade, companies have invested heavily in extracting gas trapped in shale rock formations. The formations are thousands of meters below the Earth’s surface. The process wasn’t economically possible until the start of the 21st century. Technological developments in drilling and fracturing made shale gas extraction an attractive investment for these companies. This led to a boom in shale gas production starting in the mid-2000s. The shale boom led to a sharp decline in gas prices in the US.